ALL THE PROBLEMS WITH THE BOSCH® OVERFLOW VALVE HAVE BEEN SOLVED! After 14 months of testing, Tork Teknology is releasing the world's first ADJUSTABLE over flow valve for the Cummins® 12 valve and 4BT, equipped with the P pump. Every single problem that has plagued the Bosch® design has been SOLVED, including eroded seats and broken springs. Finally, there is a reliable P pump overflow valve that is adjustable! Talk to any owner of a Dodge® Cummins® 5.9equipped with a P pump, and he will tell you he has replaced his P7100 overflow valve. Several of the HP guys are on their second and third return valve. WHY? The number one complaint that I hear is "My Cummins® 5.9 diesel is losing power and it's difficult to start". With that information, we cut many over flow valves in half to find out why. We were shocked by what we saw! Through 14 months of testing on a flow bench and on our test truck, we know exactly why the Cummins® return valve is not a good design. The Bosch® spring has a history of breaking and it loses its spring force. This dramatically reduces the fuel pressure in your injection pump. This causes low power and your Cummins® 12V will be difficult to start. To cure this problem, we use premium, custom made springs in our overflow valves. The leading spring maker in the U.S. has worked with us to produce a superior spring. The spring manufacturer tested the service life at 1,000,000 cycles to the second power. Basically, infinite life! Our new design seat and ball puts less fatigue on the spring, as well. The Bosch® overflow valve will idle at 15 to 18 PSI. Our valve will show 25 to 26 PSI at idle. The shifter on our test truck vibrates much less and the engine idles 30 RPM faster with the Tork Tek valve. Your engine will run with less vibration and experience an off-idle power increase (great for towing). Customers email every week and say that starting is much easier! The best return valve they have ever used on their Cummins® 5.9. The other common defect in the original valve is seat erosion. Many of the Bosch® overflow valves that we cut in half had rounded seats. Take a look at photo #4. The seat is supposed to be flat. It should look like a tapered cone. It's rounded from the hammering of the ball. With the seat rounded, the ball is now .050 to .075 deeper in the valve and your spring is now longer. The longer spring exerts less force on the ball. Less spring force equals less fuel pressure. That's why your valve quit working and you lost fuel pressure and power on your Cummins® P pump. Eroded seats are the second leading cause of failed P7100 overflow valves. (We have sectioned many valves) The other bad design of the OEM valve is the lack of material supporting the seat. From the chord line where the ball touches the seat to the edge of the seat, there is only .009 (three hair thicknesses) of steel to prevent seat erosion. That is not enough material to support the ball. Over time, the ball will hammer the seat to the point where your valve will not work. Tork Teknology redesigned the Cummins® return valve to eliminate failed seats. IT'S A BULLETPROOF DESIGN! Your Cummins overflow valve leaks! We have tested new Bosch® overflow valves and most of them leak. In fact, there is a technical service bulletin stating that the Cummins® valve is NOT a check valve and leakage is OK. Why would you want a valve that leaks? The Bosch® P7100 overflow valve uses a machined seat, which is OK, if not subjected to heat treating. Machined seats leak after heat treat because of thermal distortion. The secret to a leak proof valve is super finishing the seat AFTER heat treat. (see photo #5) It took weeks to perfect the super finishing of the seat and the results are worth it! 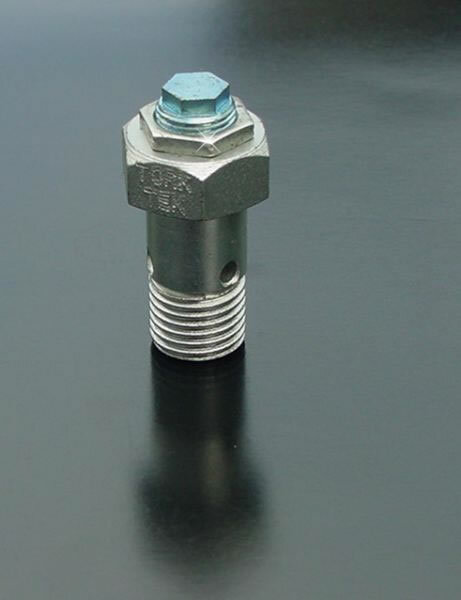 Our valve has zero leakage and acts as an anti-siphon check valve. The leak proof seat prevents back flow to the tank. Starting your Cummins® 3.9 or 5.9 will never be easier because your fuel system will always be in prime. Normally, the check valve in the lift pump would prevent back flow. Unfortunately, the lift pump check valve is not a good design. The check valve is the weak link in the Carter® lift pump. If a hose or tube develops a leak from the overflow valve to the fuel tank, fuel can flow by gravity back to the tank. This is made worse if you park on an incline. Starting the engine in the morning is next to impossible. Our design adds a secondary check valve into your Dodge® Cummins® 12V fuel system and prevents back flow to the tank. Your truck will start easier with a leak proof Tork Tek overflow valve! The Tork Tek overflow valve is adjustable! This one feature took weeks to develop. You can now adjust your fuel pressure without taking your valve apart to add shims or to stretch the spring. Simply loosen the jam nut and turn the hex plunger. This patent pending design has a range of 22 to 35 PSI. One customer purchased the valve for one reason. He said that if the spring loses a little tension in five years, he can increase the fuel pressure in minutes by adjusting the plunger. Here's a tip FOR MAX POWER. Peak fuel flow on a stock system is 31 PSI. Fuel flow will fall off above 31 PSI. The Carter® P7100 lift pump is a pressure sensitive pump and pressures above 31 to 32 PSI will show less fuel flow. This has been verified with precise flow meters. The current Cummins® Bosch® over flow valve has a .105 inlet hole. 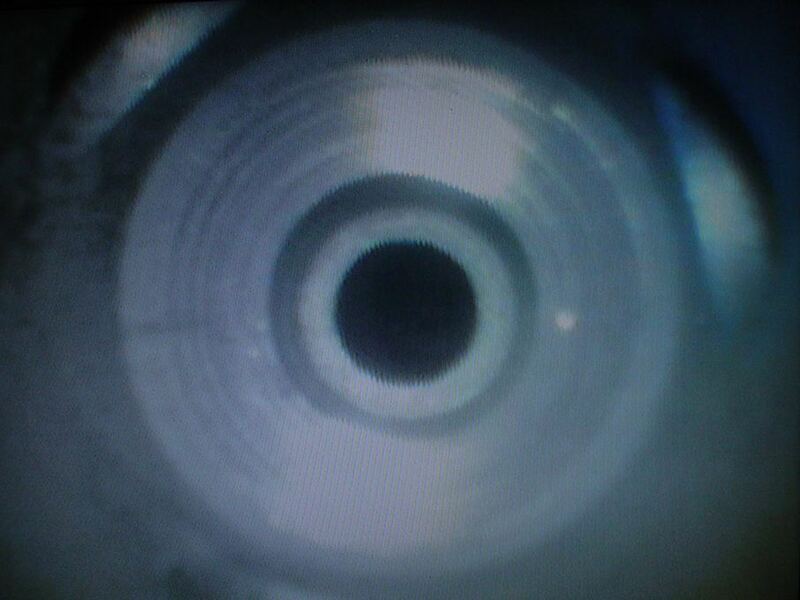 The inlet hole size used to be .168 in diameter. Did you ever wonder why the hole size was reduced? The reason is, it protects the OEM seat and spring from damage. The small hole acts as an orifice snubber. Testing has shown that the hole diameter is too small !! The problem is, the small inlet hole has created huge pressure spikes in the fuel system and is wrecking lift pumps. The pressure spikes put a terrible load on the lift pump check valves. The Tork Tek valve features an inlet hole size that reduces pressure spikes by 39.7%. Your lift pump will last longer because it is not subjected to the higher pressure spikes of the Bosch® design. A small but critical change to the inlet hole size has a direct relationship on the life of your lift pump. Our goal was to produce a valve that has superior seat life. After many tests, we discovered that the number, size and location of the outlet holes were critical to the life of the ball and seat. We engineered the new design to put minimal stress on the seat. Less stress means longer seat life. You can now run your Cummins® 12 valve diesel knowing you have the best overflow valve on your Bosch® P7100 injection pump. There is nothing worse than showing your buddy a new performance device on your truck and it's rusted. We don't black oxide any of our parts because it is not a rust resistant coating. Tork Tek plates all overflow valves in a two step process. The initial plating is coated with a second anti-corrosion sealant. Plating is a more expensive process, but it's worth it ! Your valve will look great and remain rust free for many years. The OFV020 is for stock fuel systems that run on WVO or biodiesel. We build the valve with a stainless steel spring and ball. The seal is premium Viton that will stand up to WVO and biodiesel. Several Cummins® owners have purchased the OFV020 with the intention of using an alternate fuel down the road. Included with the overflow valve are banjo seal washers and detailed instructions. Installation is easy and takes only a few minutes. 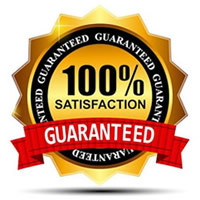 Every Tork Teknology product is covered by a 45 day money back return policy.We guarantee 100% satisfaction with your purchase or you get your money back. The TorkTek adjustable overflow valve is second to none. It is a direct replacement for the Cummins® 12V overflow valve. It will be the last overflow valve you ever buy! Order yours today and take advantage of $1.95 shipping. PLEASE NOTE: THE OFV010 and 020 ARE NOT TO BE USED WITH A FASS OR AIR DOG PUMP. IF YOU RUN EITHER OF THESE PUMPS, USE THE HP OVERFLOW VALVES. THE NEW DESIGN VALVE WILL GIVE YOU MUCH BETTER FUEL PRESSURE AT FULL POWER. John Hanson of Marion MT said it best! I just got back last night from a trip to Lincoln, NE and back, hauling Clydesdales. We crossed the scales at 23,500#. 4 Clydesdale mares, in a 6 horse slant Trail-ette Constellation trailer, pulled by a '94 Dodge 3500 4x4, with a 6 speed. I've driven big trucks (own Kenworths® and Peterbilts®) for over 30 years and that little 6bt Cummins® just never ceases to amaze me! The valve works awesome! Going down the road, it stays right about 28-30 and stays nice and steady! I don't see the fluxuations I used to with the old valve, so I'm a happy customer. You do nice work!! Thanks for the quick shipment. I installed it Monday morning, it worked perfectly. A couple of years ago the original overflow valve was getting erratic. A pressure gauge showed less than 10 at idle and less than 20 at 2000 RPM. Also the pressure varied a lot. The local Dodge® garage wanted $186. I bought an overflow valve through eBay that was non-adjustable. It did not include new seal washers. The spring was retained by a ball bearing pressed in place. I wasn't impressed but I installed it. Last week we took our fifth wheel trailer on a 250 mile trip through the West Virginia hills (with your valve installed). It performed better than it ever has. Seems to be fueling better. The truck/trailer combination weighs 23,000 lbs. JR from Widcat Performance loves the overflow valve and snubber. This is what he says "The truck starts fantastic-crank and boom she's running. Watched the pressure gauge and it was as close to steady as I have seen!! ..... looks like your R&D paid off here"
….fantastic product!!!! Hardtailjohn purchased an overflow valve on June 16,2010. T. Dought "Excellent Product, Works Great, Will Buy More Soon". skycucv "nice upgrade from stock and looks very well made, A+ Many thanks from U.K". The first article on the Cummins® fuel system and lift pump is done. 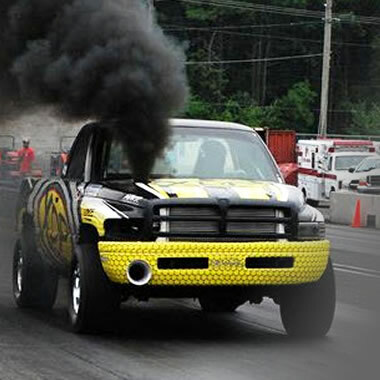 Feel free to share the link with your diesel friends. We made hundreds of tests on the P7100 fuel system and the information is available to you. Tork Teknology's motto is to share the knowledge. That is why we offer this report for FREE ! Article number two is ready for your reading. This 6 page article is not white bread fluff! It is a very meaty guide on the importance of the inlet line. Getting the inlet line size right, on your performance engine, is critical in achieving maximum diesel horsepower and torque. Use this link to view the instuctions for the Tork Teknology Cummins®Adjustable Overflow Valve. This valve saved my marriage! I just got back from a shakedown run after installing the new 020 overflow valve I purchased from you. Wow! I didn't know my old truck had that much life left in it. It idles, revs, and drives much smoother and quieter. It just sounds and feels right again. For my truck the loss of power and increased NVH came on gradually as the OFV failed and kept getting worse. This was multiplied by the fact that I stopped driving the truck daily a year ago when I received a company vehicle. Every time I would get in it things just didn't feel right, and the loss of power was finally driven home when I couldn't maintain speed up a grade towing nothing but a 6x12 trailer and ATV. I had gotten so frustrated I was thinking of trading the truck off and spending 40K+ on a new one. Man am I glad I decided to give the OFV a try first! If it keeps running like this I should get at least another 150K miles out of it. So, in closing, the way I look at it your product saved me 40K plus whatever a divorce and half my net worth would come to. I know an OEM part could have made a similar improvement, but your obvious engineering skill and willingness to improve upon a poor design sold me on your product. I'll be shopping Tork Teknologies again in the future. Hey Tork Tek, i just purchased the OFV 020. i just installed it the other night, and what a difference, i was having terrible problems starting the truck, and low fuel pressure. New valve in! The truck starts right up, not a problem! 23psi at idle and works awesome! Thank You soo much, i fought with this problem for months! I was having trouble starting the truck up in the morning and after fiddling with it for a while it turns out I had a low fuel pressure because of my old valve. The OFV020 valve raise my pressure up to 24psi idle and 33 psi with moderate load. Power got back to where it should be and starts up perfectly every morning. I will probably adjust it back down 2 psi to get closer to stock specs. Thanks for good customer service when I called. I'm sure you get these a lot but thought I'd still send it out. Just installed a new OFV in my '97. Before i was having trouble with rough idle and slow turbo spooling. Man am I happy I spent that $50. I now see 22psi at idle and up to 30psi when I get on it. Rough idle is gone and my spool time is back up where it should be. Great product - better service! I had a lot wrong with my fuel system including the lift pump and OFV. After replacing my LP I could still only push about 13psi. A quick and easy replacement of the OFV with this one brought me to 28psi at idle and 30-32 when cruising. Great product, and the service was even better. Fast shipping, good price, fixed the problem. All around good! I installed the valve in an 8.3 Cummins and all the power was back. It idles smooth and throttle response is there like it should be. I had no idea it was running so poor until I put in the OFV020 valve. I have had the OFV020 installed in my truck for 5 months and have had no problems with the product at all. Installation was a breeze and the extra mpg was great. I don't know for certain if the previous check valve was working propperly or not, but I decided to replace it anyway since everybody said that it is the best place to start when diagnosing a problem. With this product I went from an average of 14mpg in town to around 16mpg in town. I would highly recommend this product to anyone. Thanks Tork Tek for the great product. Fast delivery and easy install. It fixed my problem and got me back up and running. I ordered an OFV 020, back when I realized my stock OFV was beyond bad. After talking to Rob, he was able to explain in detail exactly what I needed for my application, and I went ahead and ordered the 020. Install was simple, along with adjustment, and I was very happy with the results. Fuel pressure went up about 10-15 psi, throttle response was much quicker and smoother, and overall, I'm very happy with the product and the company. High quality valve, smooth idle and power band. I recomend this valve ! service and a super break on shipping. I couldn't be happier, Thanks Rob. I replaced the stock overflow valve with your OFV020. At the same time I replaced the 14mm banjo feed bolt. At idle gauge shows 20psi from the mechanical feed pump, at 1100 rpm 25psi, at about 2100rpm 30psi. Off idle responce is great and noticed right away the engine pulls hard and even from the bottom up. Great product guys! Great Product and Service from Tork Tek!!!! Over the twelve years that I worked at a Cummins distributor, I saw many variations of the over-flow (cascade) valve and the issues that each one had. Tork Tek came up with solutions to the issues and used that information to make the best over-flow valves that I have come across. I now use only Tork Tek over-flow valves, plus I love that I can adjust the pressure to each individual truck without the high pressure spikes that the current over-flow valves cause. 95 12v with 215k, changed valve in 10 minutes, smoother idle, more power on acceleration, best $50 I put into the truck! Tork-Tek over flow valve worked great right out of pack! Just got overflow valve install today! Haven't had time to do test drive yet but was surprised that pressure came up where Cummin's say they should be! No more hard starts and hopefully more fuel economy. hey i read your article online about the 12v lift pump and would like you to send me the rest of it.. Ordered a ofv20 on a friday, received it the following monday. Talk about fast service. I wish more companies operated this way. Never really had a problem with power or starting, even with 12 psi at idle, but decided to replace overflow valve anyway. Glad I did because the power delivery is much smoother now. I now have 18 psi at idle and 28 psi wot. Excellent product, worth every penny. .I bought the TORK TEK OFV020 after seeing pressure readings allover the place ....When I got it I changed it and the filter ,tried to prime the sys. and found the liftpump was dead...zero pressure now....well I swore I would not get a mechanical pump again..so I got a Carter P5000 , tied it in to the already existing wires at the tank sending unit and got 45-55 psi..well I adjusted the OFV020 and now I have 35-40 psi ...runs great ,Love it. I bought the ofv 020. 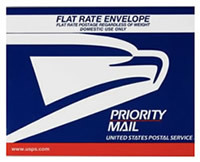 I was very pleased on fast I got it and how fast any problems were addressed. This companies customer service is one that other companies should model themselves after. I am happy with the product that I recieved and they will get my buisness again. I had a boost problem and was looking to buy a fuel pump, i called the site ,asked a few questions, he recomended i try the overflow valve first. then primed and started the engine,5 psi at idle and 15 psi wide open throtle. i then added the overflow valve 15psi at idle 25-30 psi at wide open throtle. this also took care of my boost problem,i was running out of fuel. total time about an hour to change both fittings and prime the motor,well worth the time and money . I had good pressure at idle, but it was only 20psi at WOT and I would like more. I was able to set it higher at idle and the idle did smooth a little, but I wasn't able to get anymore pressure at WOT, even with a new lift pump. So it didn't solve my problem, but it is nice being adjustable. I'll probably add a booster pump, and the ajustibility will be needed. First rate product and customer service at a very fair price. Included instructions are clear and complete. Installed in minutes, no drama and fuel pressure at idle is 21 lbs and at load hits 40lbs. Truck feels completely different and pulls much harder out of the hole. My fuel pressure was a bit low with the stock overflow valve after 300,000. This took care of it! GET ONE! Even if your not having fuel issues! Don't let the 15 minute install time scare you! That also includes getting your 3/4 wrench out, installation, sucking down a cold one and clean up! But seriously, even with a bad lift pump I could tell a difference. After replacing my lift pump I am running better than new! Customer service was excellent, Rob is very knowledgeable and takes the time to answer all your question, with enthusiasm I might add! You need one, Especially if you run veggie fuel! What a diffference 15 minutes makes. Just arrived and installed 15 minutes later. Now the 1998 12V CTD idles, NO white smoke at start up, and it is smoother. Took like 3 days to get to me. Hope to have a fuel gauge next week and hookup the snubber as well! There are cheaper ones on auction and most other online places wanted MORE for OEM. Glad to see excellent products coming out of my old home state!